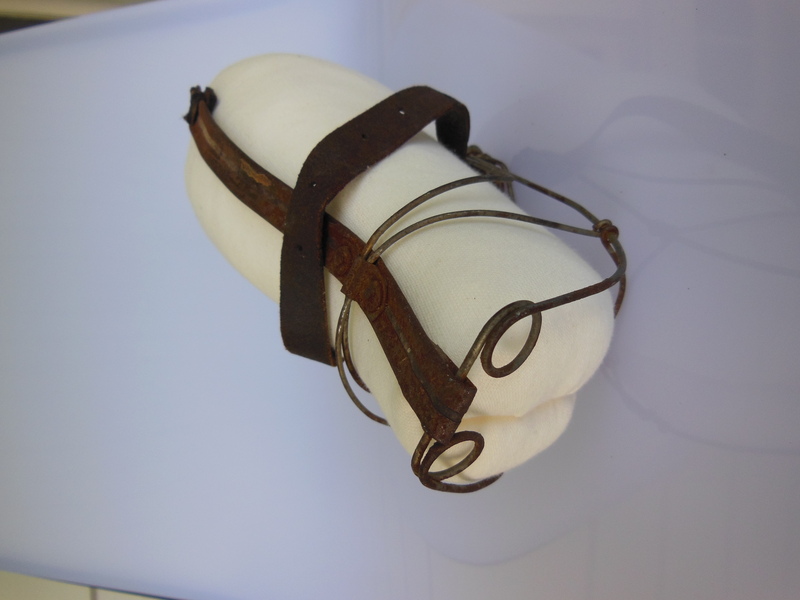 In 2005, I purchased this Victorian dog muzzle from an online auction. I knew what it was because I had seen a wood engraving from 1900 of a similar (or perhaps it is the same) muzzle. It’s a very rare survival of a utilitarian object — an artifact that, I imagine, no one loved or felt sentimental about. It survived, even in its broken condition, because someone just didn’t throw it away. The small image is a detail from a catalog from a sporting good company that also sold dog supplies and equipment. I think that my muzzle is the “Patent Automatic Muzzle,” shown in use in the larger image of a dog’s head. 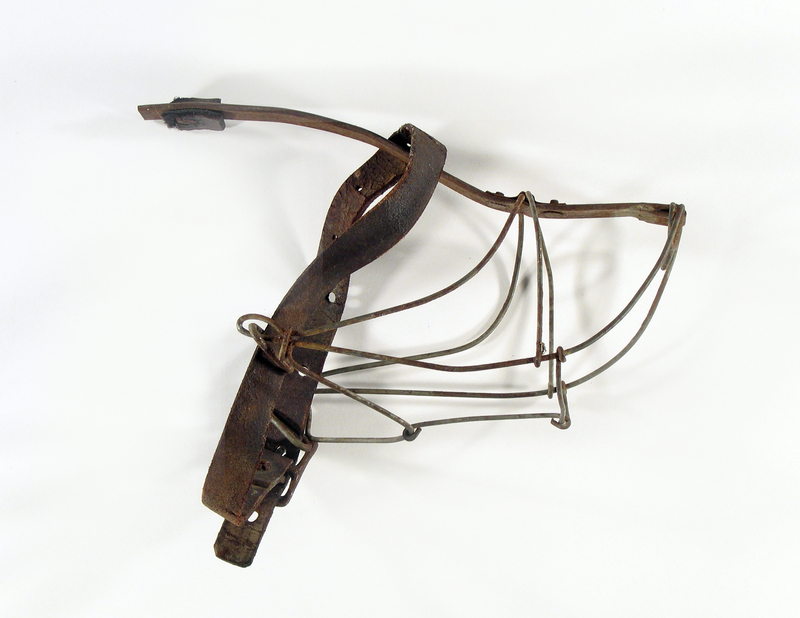 These muzzles were apparently designed to allow dogs to breathe easily, drink water and pant, while preventing them from opening their mouths wide enough to bite. “All I Did Was Growl a Little,” after Vincent Colby. Lithograph, ca. 1910. Another view of the muzzle shows one of its most extraordinary features: it has loops of wire that are “nostrils.” This embellishment can’t have made any difference in the muzzle’s effectiveness; it seems to be purely a matter of style! The side view of the muzzle also has a kind of delicacy; it seems to follow the head shape of an imaginary dog. While muzzling was common, people also made fun of the practice, suggesting that people worried entirely too much about dog bites. 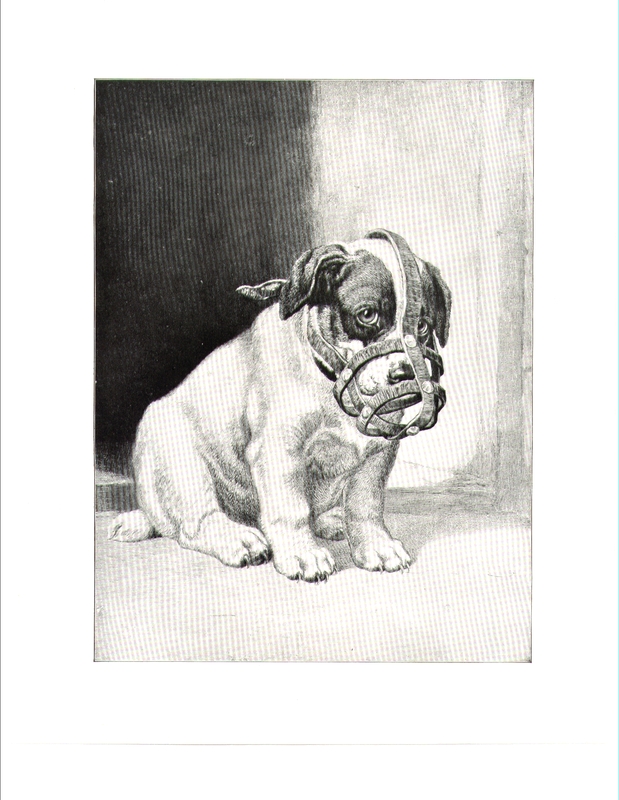 Around 1907, the postcard artist Vincent Covey published an image titled “All I Did Was Growl a Little.” It became popular and was reprinted in a variety of forms, including a version titled “For the Safety of the Public.” The image was sold as prints to be framed (as in the illustration here) and even appeared as an outline drawing on a wooden plaque intended for use in the turn-of-the-century home craft of wood-burning. Dog muzzles and ties offered for sale by J. C. Decker, Inc., Montgomery, Pennsylvania, 1939. 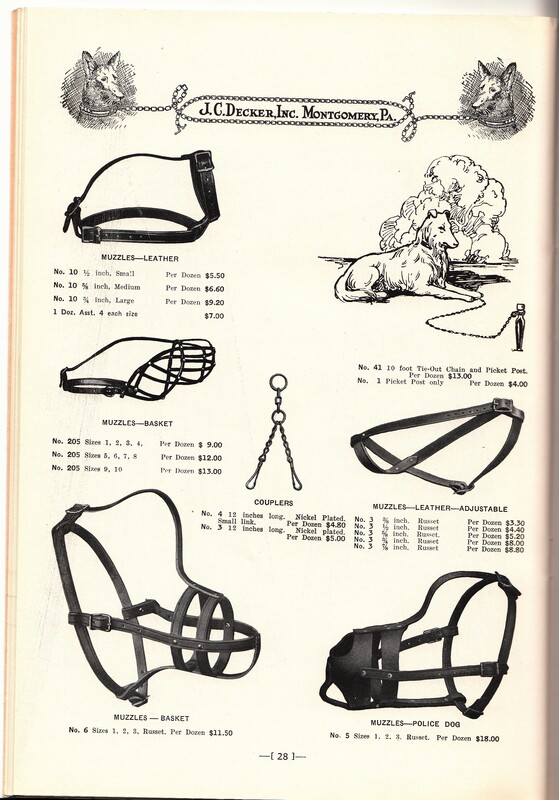 By 1939, fancy wire dog muzzles were replaced by these sturdy leather examples from J.C. Decker, Inc., a company that made leashes, collars and other dog equipment. Notice the muzzle on the lower right; it is a “police dog” muzzle. Next Meet Wrinkles Vaughn — Happy National Dogs Day! Hello! 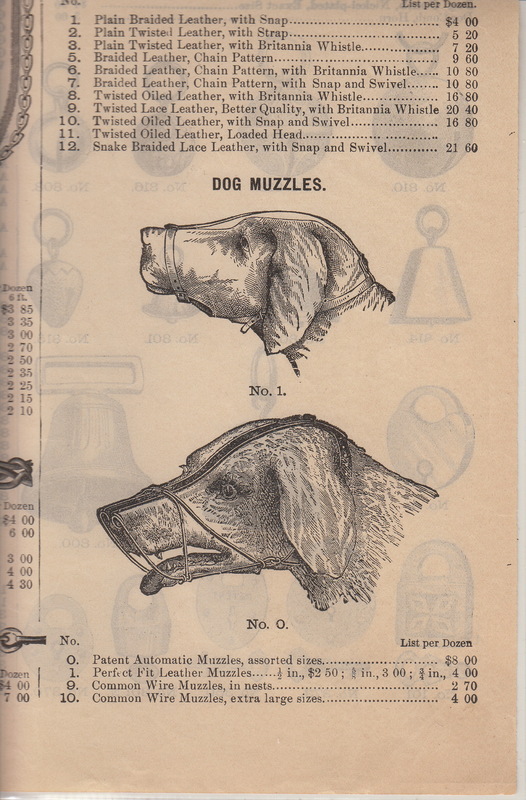 Thank you for your blog post about dog muzzles in the 1900s. You are so far the first site on the internet (using a verity of word positions and sentences – so much for the current Google A.I.) that has any historical data on the dog muzzle. I am in search for when the muzzle was invented, by whom and from which country. If you happen to know please contact me, otherwise, it’s off to the libraries. Dog muzzles are ancient, actually — I believe that they show up in sculpture and in medieval images, too. In the case of some hunting dogs, the hunters wanted the prey brought down by dogs but not torn apart. Also, since male dogs were not neutered, muzzles kept them from fighting. Good luck with your research — if you find more specific information than this, I’d be grateful to see it.